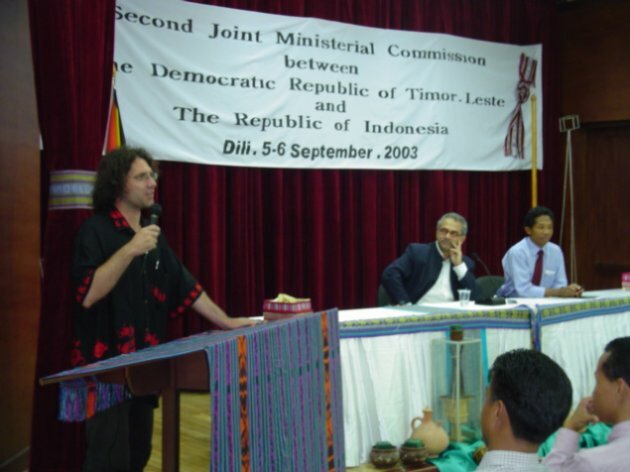 Lev Lafayette has worked for a year at the Ministry of Foreign Affairs and Cooperation as the Information and Communications Technology Policy Adviser, a position funded through Australian Volunteers International. During this time he has brought a wealth of experience and knowledge to the Ministry. As the senior systems administrator and senior technician for the Ministry he has maintained our 74 node local area network and developed a number of professional and unambiguous policies. He has also acted as the Ministerial representative in liaison with other appropriate national and international organizations providing substantial contributions to the development of our country-code top-level domain, the development of software for our national passport database and initiating discussion on national wireless networking. His activities have included establishing, designing, and coding the only Ministerial-level government website for the nation. This website, consisting of over 500 pages of content in four languages, has also been designed with the highest international standards for accessibility and web-browser compatibility. The website is the quickest loading foreign Ministry website in the world and will be nominated as for the DiploAward 2003. Always prepared to share knowledge, Mr. Lafayette has written a comprehensive, two-hundred page, computer users manual . Whilst the manual itself will remain a valuable resource for many years, Mr. Lafayette also conducted an intensive training course to familiarise staff with the basic concepts along with consistent mentoring to our two other IT staff. Finally, Mr. Lafayette leaves the Ministry having outlined a detailed IT development plan for the next three years. A diligent and consistent worker, Mr. Lafayette has made a lasting impression on the Ministry. His high standards of research and serious commitment to professionalism have set an example, as has his preparedness to assist users in the most minor technical issues and carefully explain circumstances with good humor. Mr. Lafayette also made the effort to gain a modest understanding of our vernacular language (Tetun) and an understanding of our culture and history; this alone speaks volumes for his character. I am confident that any who are fortunate enough to work with him on any endeavour will come to the same conclusions as I have.